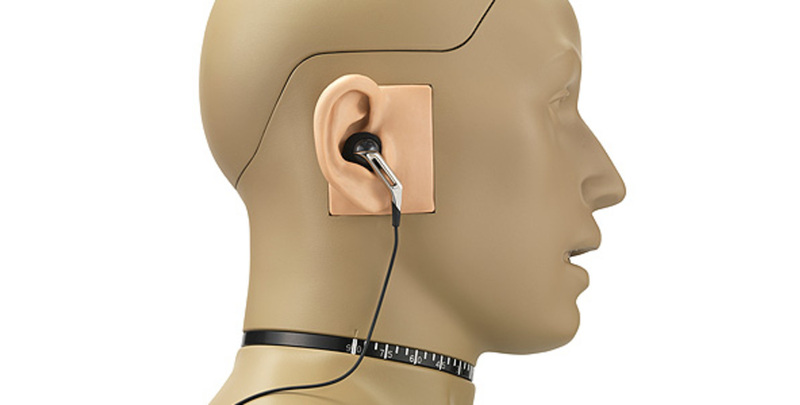 The 45BB-10 is a KEMAR head and torso for ear and headphone test, with prepolarized ear simulators and anthropometric pinnae. It complies with IEC 60318-4 and ITU-T P.57. and is measured and calibrated according to ITU-T P.57. It embodies a number of carefully designed volumes connected via well-defined and precisely tuned resistive grooves. In an equivalent electrical circuit, capacitors would represent the volumes, and inductance and resistance would represent respectively air mass and air flow within the resistive groves. It is delivered with a built-in GRAS 40A0 1/2" prepolarized pressure microphone. The anatomical shape of the pinna makes it possible to achieve very good fit and sealing with anatomically shaped in-ear transducers. The improved fit and seal also means that the low frequency response is improved. It will allow you to reproduce base notes, as well as effectively measure (active & passive) attenuation. Therefore, the 45BB-10 KEMAR is ideal for accurate and repeatable testing of headphones, earphones and in-ear hearing protectors.